From parks to sandy beaches at the seashore, we all enjoy a vacation now and then. 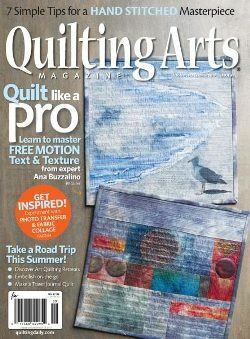 Whether this year’s trip is a “staycation” or sent you across the ocean, this issue of Quilting Arts is for you. Think about your travels as the source of inspiration for your artwork as you learn about new surface design techniques, innovative ways to embellish, and interesting free-motion quilting motifs. Ana Buzzalino and her precise free-motion text. The last installment of Susan Purney Mark’s “Shifting into Neutral” series using Procion dyes. Wen Redmond’s approach to creative photo transfer and collage. Natural pigments with Chantal Guillermet. Lynn Krawczyk’s simple yet stunning hand embroidery. A new mounting technique with Candy Glendenning. Straight from the sketchbook travel journal quilt with Jane Haworth. Plus so much more!